A couple walk the path around Hibiya Park’s Japanese garden. In the distance, to the west, can be seen the rooftops of the various ministries along Sakuradamon-dori in the neighboring Kasumigaseki government district. 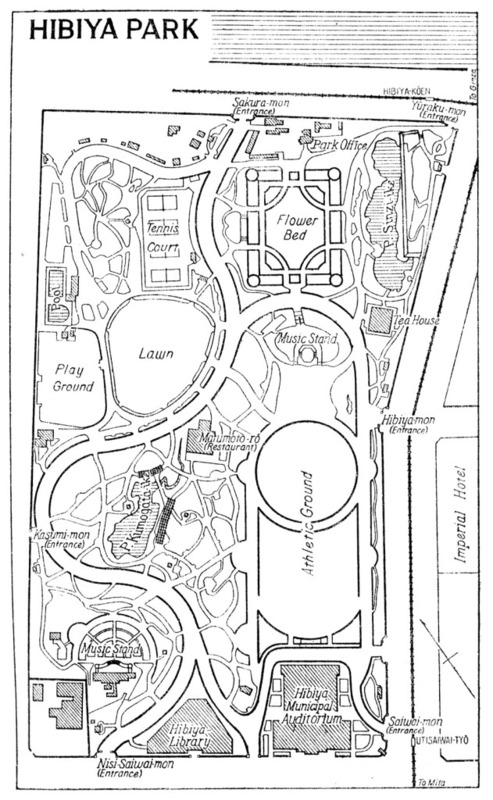 “Some liked the new park, some did not. 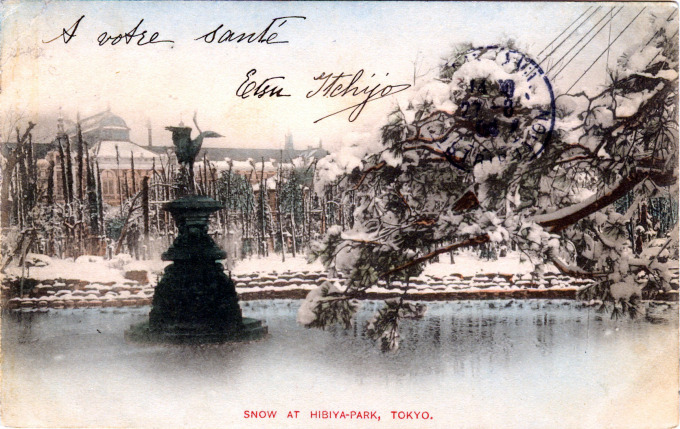 Nagai Kafu, on his return from France in 1908, found it repellently formal. It became so favored a trysting place, however, that the Kojimachi police station felt compelled to take action. On the summer night in 1908 when a dozen or so policemen were first sent into the park, they apprehended about the same number of miscreant couples, who were fined. “Hibya is usually referred to as the first genuinely Western park in the city and in Japan. That is what Kafu disliked about it – he did not think Westernization worked in any thing or person Japanese but himself. Snow at Hibiya Park, Tokyo, c. 1910. 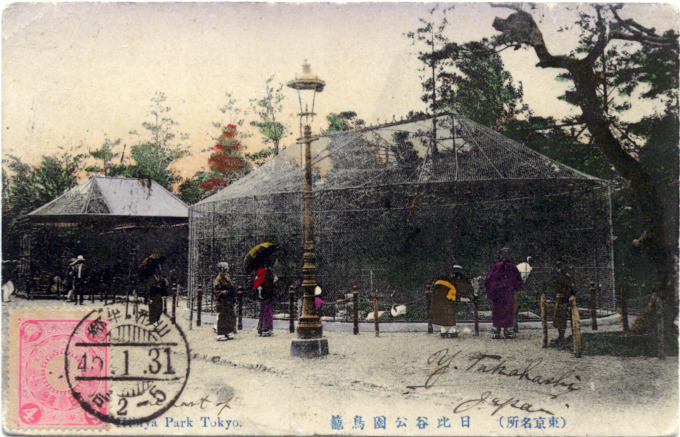 Aviary at Hibiya Park, c. 1910. Hibiya Park’s gazebo, c. 1910. Viewing azalea’s in the spring, c. 1910. 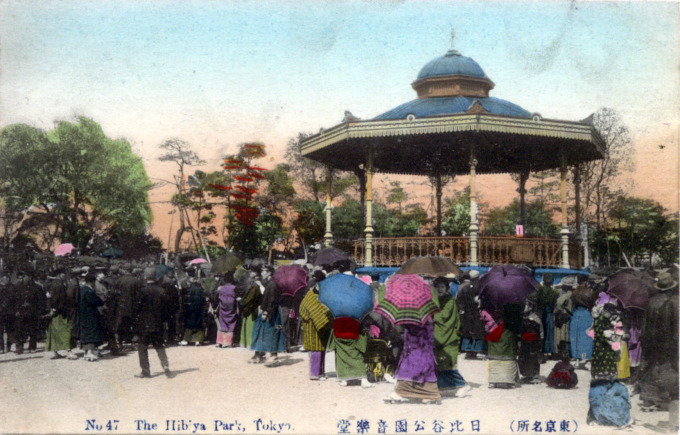 The bronze crane fountain at Hibiya Park, c. 1910. 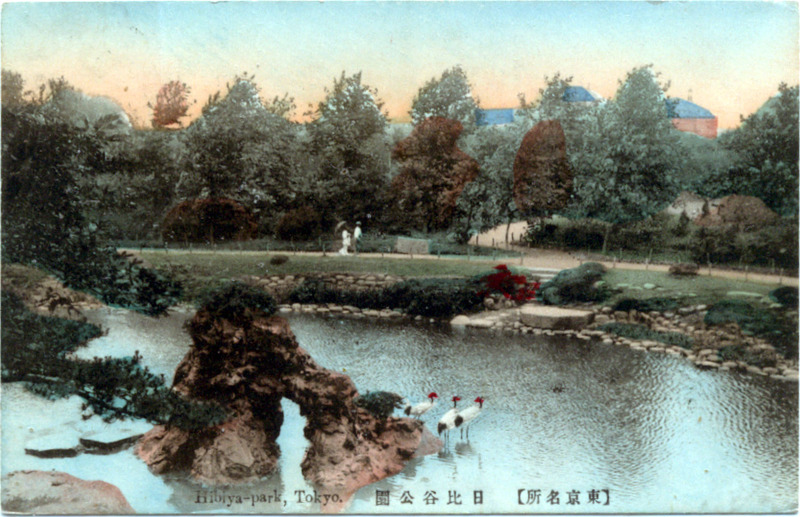 Viewing one of two ponds in Hibiya Park, c. 1910. 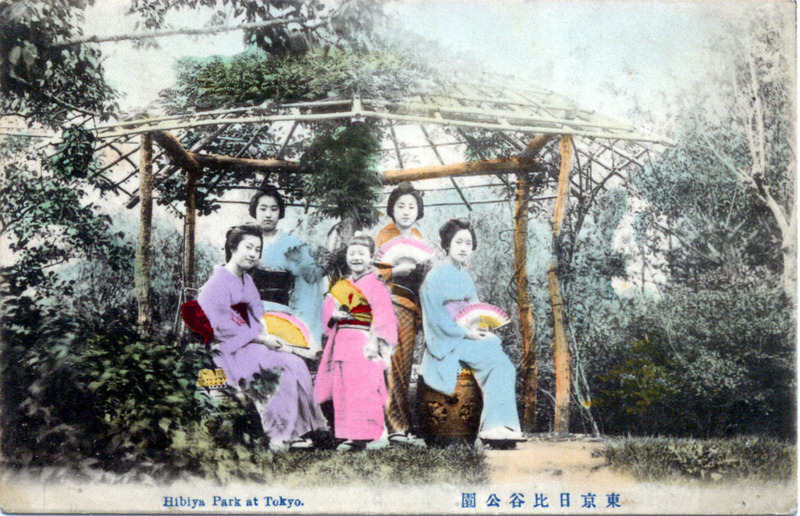 Geisha posing under an arbor, Hibiya Park, c. 1910. 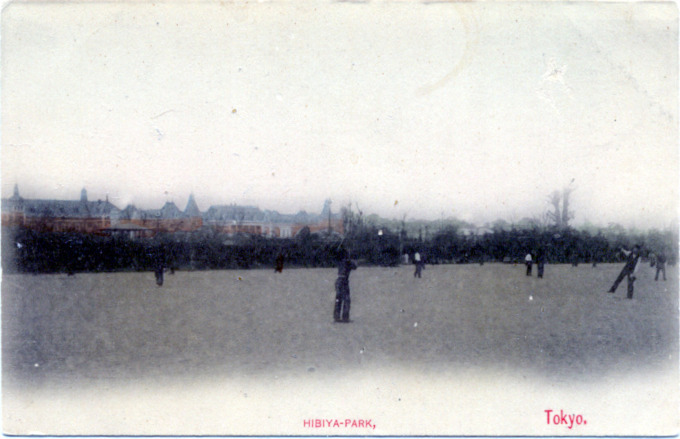 Hibiya Park athletic ground, c. 1910. 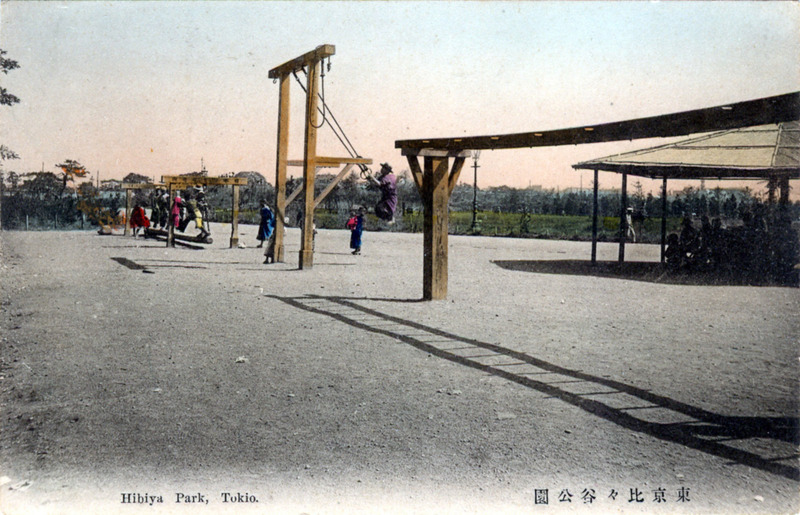 Hibiya Park playground, c. 1910. “In Japan during the Meiji era, as in Europe at the same time, the sense of national unity was stressed as an important moral theme. The state voluntarily used the landscape and its meanings to re-found the national identity. 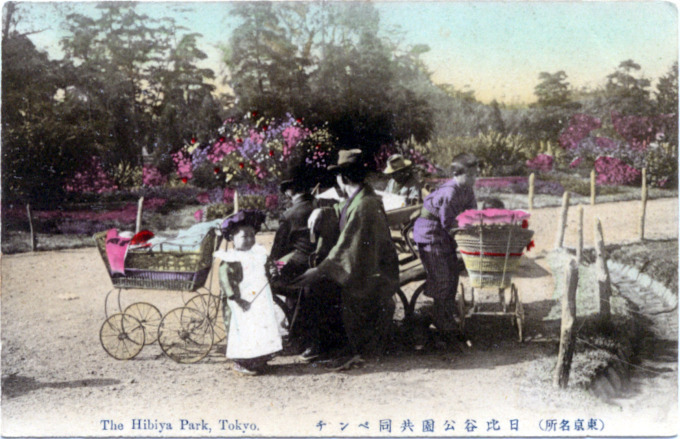 In the plan of Hibiya Koen [park], three essential elements structure the project: a large sport ground, a Japanese garden, and large paths suitable forhorse-drawn carriages. 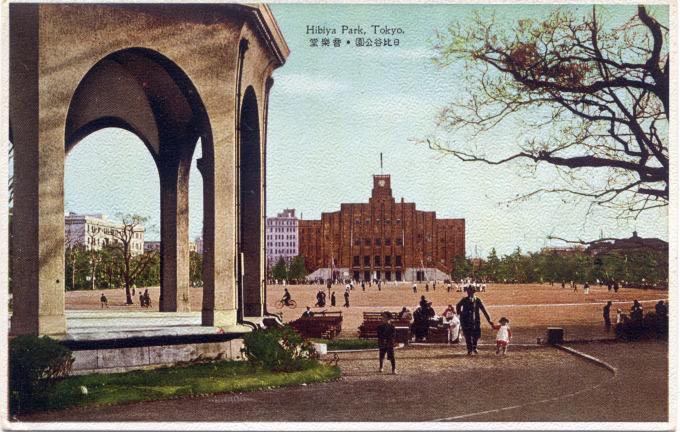 Looking south across the Hibiya Park athletic ground at Hibiya Public Hall, c. 1930. Hibiya Park, c. 1920 in proximity to the Kasumigaseki government district (left) and Yurakucho (right) where the original Imperial Hotel (1890-1923) was sited. 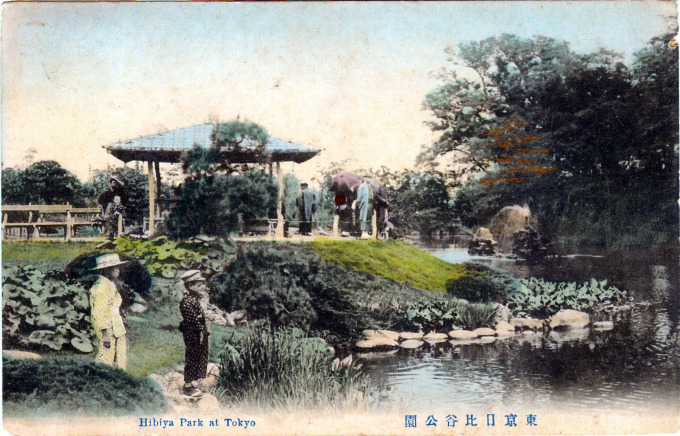 Hibiya-koen [sun match valley park] opened on June 1, 1903. 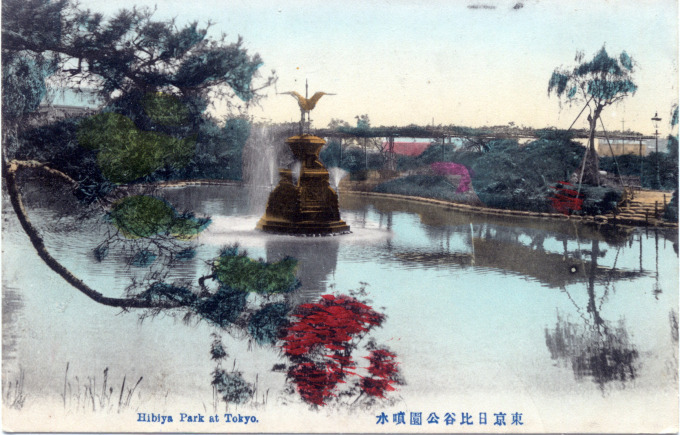 Said to be Japan’s first Western-style park, and viewed as Tokyo’s first proper public park, Hibiya Park was meticulously planned by the national government as yet another display of Japan’s modernization after 1868. 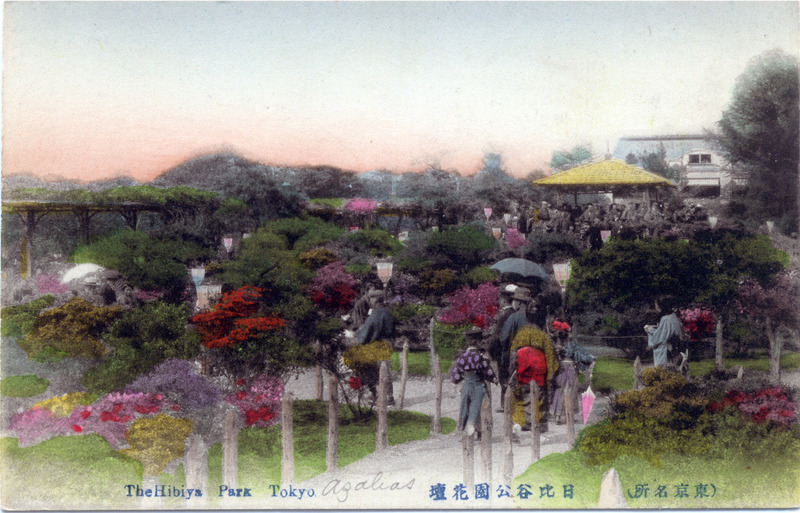 The park grounds were developed from land originally owned by feudal daimyo, the Tokugawa-era provincial lords, whose grand estates occupied the neighborhoods immediately surrounding Edo castle. After the Restoration, the estates were appropriated by the Meiji government, the residences leveled, and the grounds turned over for use by the Imperial army as military drill grounds. City planners drew up plans to convert the army grounds into the capital’s ministerial and bureaucratic district but were thwarted by the underlying soft subsoil. (The area had once been an inlet of Tokyo Bay but was reclaimed in the 17th century with debris from the Kanda canal project.) 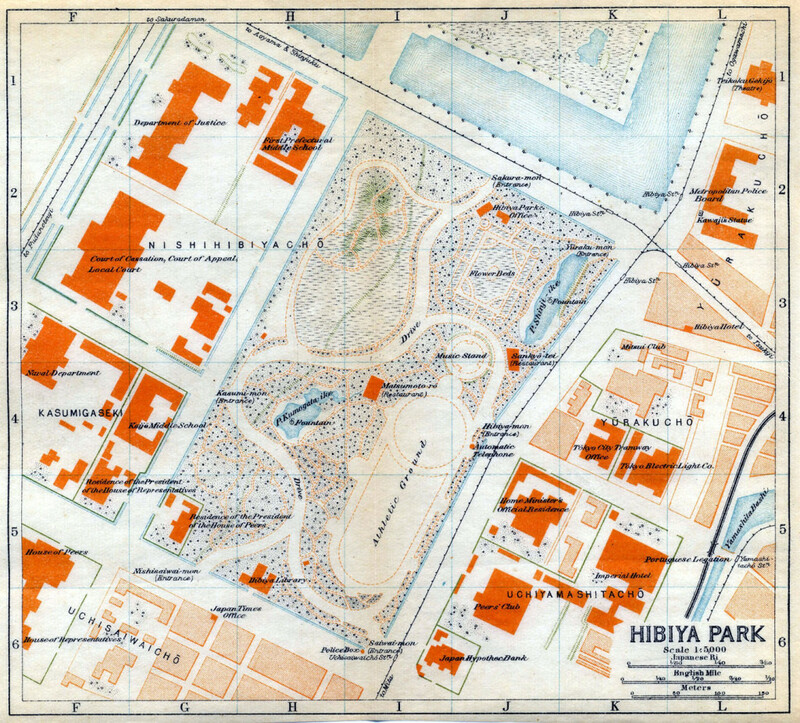 The government construction project was then moved slightly west from Hibiya to more solid ground at Kasumigaseki. Hibiya Park, c. 1940. Directly across from the park, at right, was located the famous Frank Lloyd Wright-designed Imperial Hotel (1923-1968).